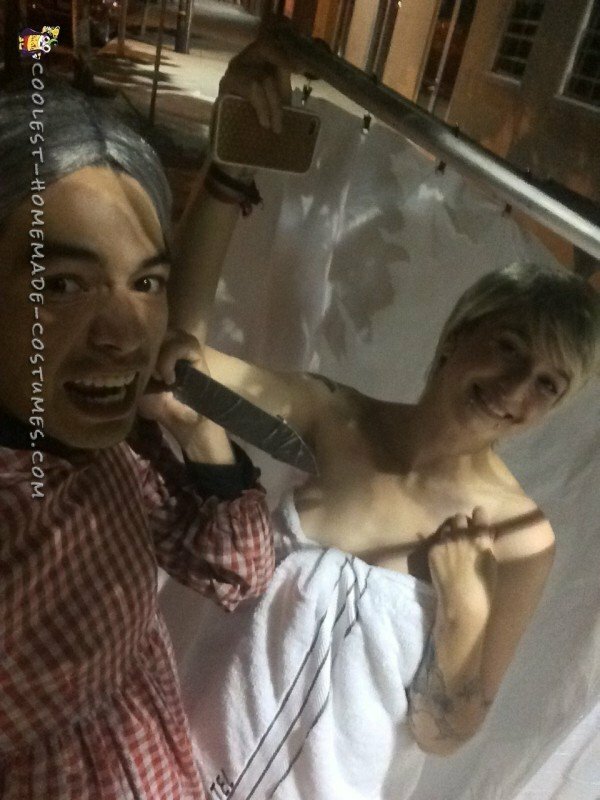 Demi Kourtesi and Lopati Ho Chee star in these versions of the Psycho Movie Halloween costumes. 5) Don’t talk about fight club! Demi is the creative director between us and I am more of the copywriter. We were sitting their thinking about ideas that we can do months before October. I mentioned a few failed Ideas and then, like a knife to her face Demi was hit with a brilliant idea! “OH MY GOD! I HAVE THE BEST IDEA!!! LET’S DO PSYCHO! I’ll dress up as Marion Crane and you can dress up as Norman Bates who dressed up as his mother! And let’s reenact the shower scene” and like Normans mind, we were off and running. We then began our research, looking up clips of the scene and pausing it to take notes. We even went and saw the movie at our local theater which was doing a special movie showing of it. In addition, we even bought the movie after and looked for anything that we could add to the costume, all for SCIENCE!!! 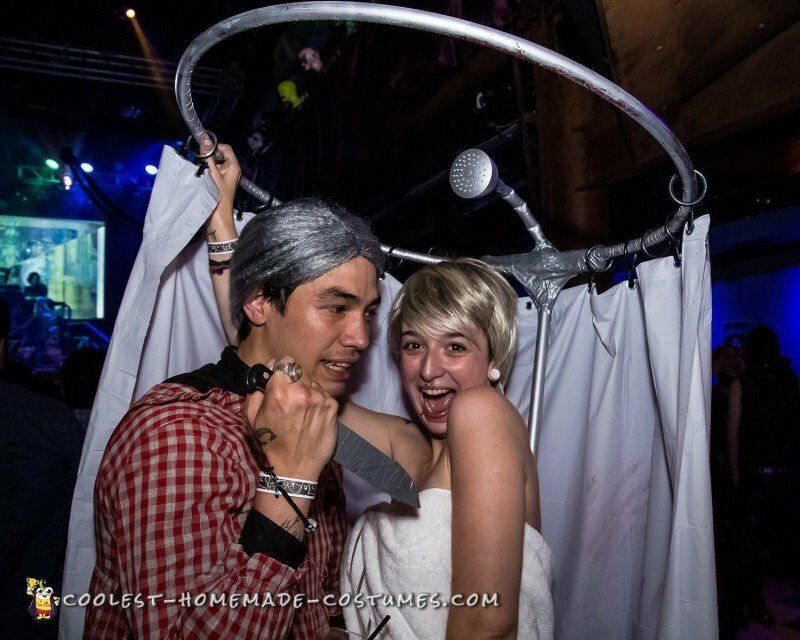 :P. After extensive research (and charts :P) we had every idea that we needed for our costume and just like Marion Crane… it was going down! My costume was simple for Norman, I had a grey wig with a black button up, slacks and dress shoes with an old looking plaid dress on over it. We needed a knife for Norman and everywhere we looked we just couldn’t find the right looking knife, so what did we do? The same thing Norman did, we got a real one!!!! MUAHAHAHA… but we child proofed it of course. We added a cardboard padding to it and wrapped it vigorously with duct tape. Now this is where things got tricky. We needed something to act as the shower, so we bought a big enough hula hoop to be our shower rod, a shower curtain for privacy, curtain clip rings to allow the curtain to shut easier, a PVC pipe to hold the shower rode up over her head, a shower head, gray spray paint (yes we are well over 18, silly hardware store) and fake blood. In order to attach the curtain rings to the hula hoop, we first had to cut it. We then duct taped the hula hoop back to its original shape and spray painted the hula hoop, shower head, and the PVC pipe grey. Then duct tape helped hold those three pieces together. We then clipped the shower curtain on to the rings and took the fake blood smeared it on our hands and pressed them on to the curtain to add the effect of struggle which is embodied in that scene. The next step was to find a way to attach the shower to her body, so we grabbed two belts (which we had sitting around) and wrapped one to the upper part of her torso to keep the shower in place and the other around her waist to keep it from leaning to far forward. Lastly we had to dress up Demi up as Marion Crane. 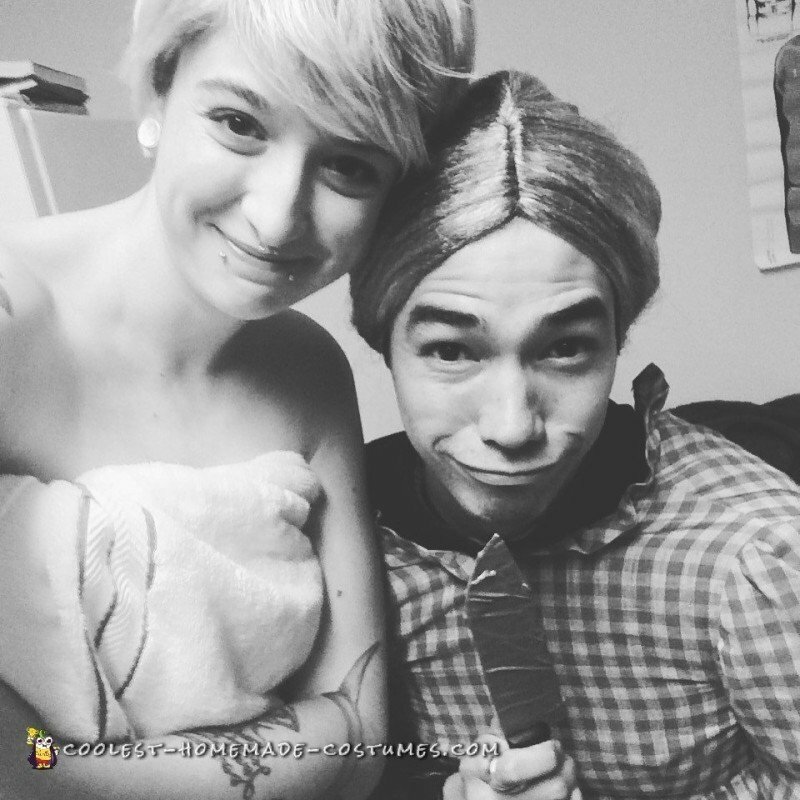 We purchased a blond pixie cut wig to match her hair style which was easy enough but then we had to think about how we were going to dress her up without being completely naked. 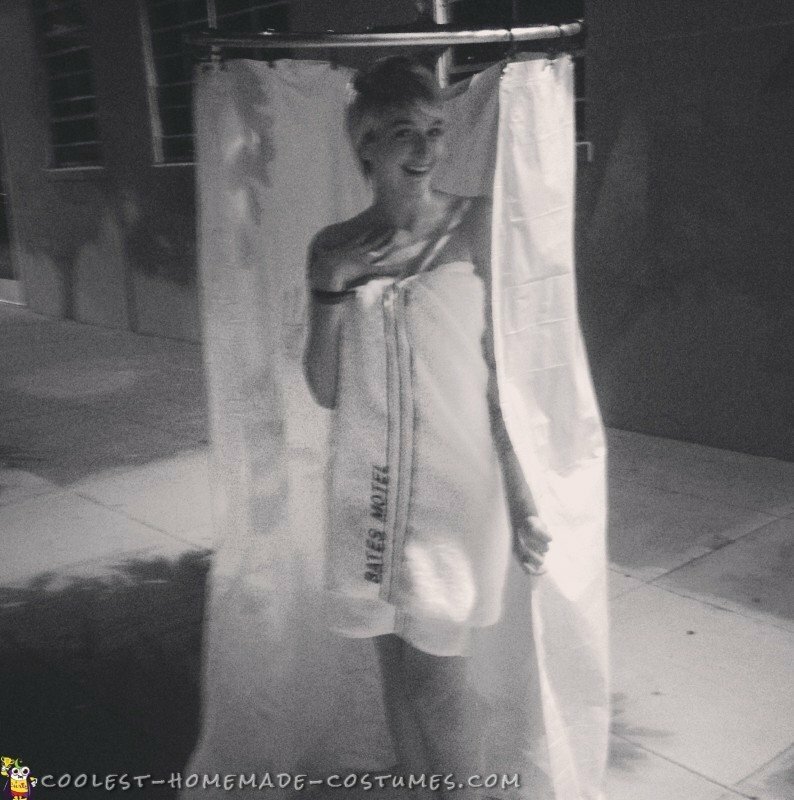 So we did as most modest people do and used a towel as her costume to shower in! 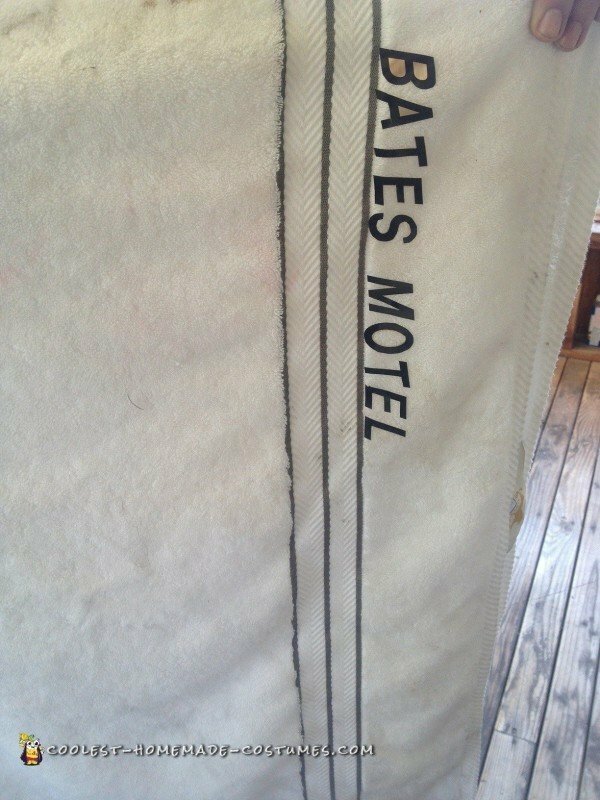 We had a white towel (again it was sitting around at the house) and went out and purchased mail box stickers so we could attach them to the towel and spell out Bates Motel onto it. Wam bam chicken lamb we had our costume all ready to go! On the Friday before Halloween last year, we went to a costume contest at a club in downtown SF. While we were waiting on the contest to begin we met a lot of amazing people in amazing costumes. Everyone we heard from loved our costume and we ended up taking a bunch of photos with people. When the time came for the contest we stood up and waited in line to walk up onto the stage where the people in the crowd would decide is you made it to the next round or be booted off. Once it was our turn we had to stand next to the hosts of the event and listen for the crowd and boy they went nuts! We went from round after round with people getting eliminated and our nerves were getting high but before we knew it we were in the top three along with Ronald McDonald Thor and another couple. The first two went first and then it was our turn again… once we stepped up a roar of drunken screams left from the people’s mouths and into the judge’s ears. It was time for them to decide the winners. After waiting for a min and all I could think was “they’re probably watching me! Well let them! Let them see what kind of person I am. I’m not even going to swat that fly! I hope they are watching they’ll see, they’ll and they’ll know and they’ll say why she wouldn’t even harm a fly!”. 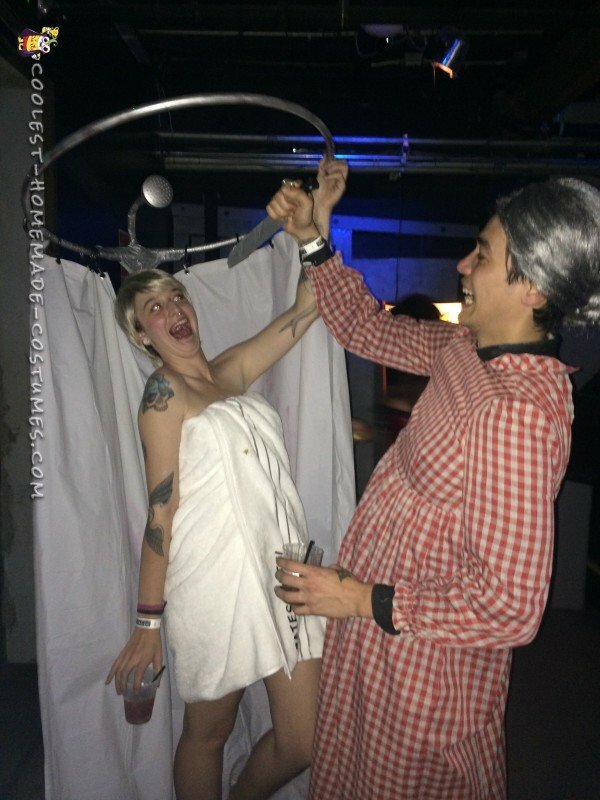 The judges finally got back onto the mics and announced “and this year’s winner for the costume contest is… PSYCHO!!! !” We were so happy! We walked up to the judges and they handed us our winnings and we took a bow to the audience. It was amazing and we couldn’t even believe it. What an amazing night, not only for winning but for our hard work. For Demi’s brilliant idea of our movie Halloween costumes to get the reception it received, was just the best. Mother was very proud of me but it was time for that girl to put on her swimming *trunks* and take a dip in the lake, then and only then will mother be truly satisfied.